Teddy and Annika enjoy Sunlight Beach, with Robin and Katie in the background. Last week we became tourists without going far from home. The occasion was a visit from granddaughters Sophia and Annika and their mother, Katie. I guess some people would call it a staycation, but when you’re retired, every day is a staycation. Katie and girls flew in on Saturday afternoon and, after driving back to Whidbey, we started them off with a home-cooked dinner of salmon (Sophia’s favorite) and noodles (Annika’s). 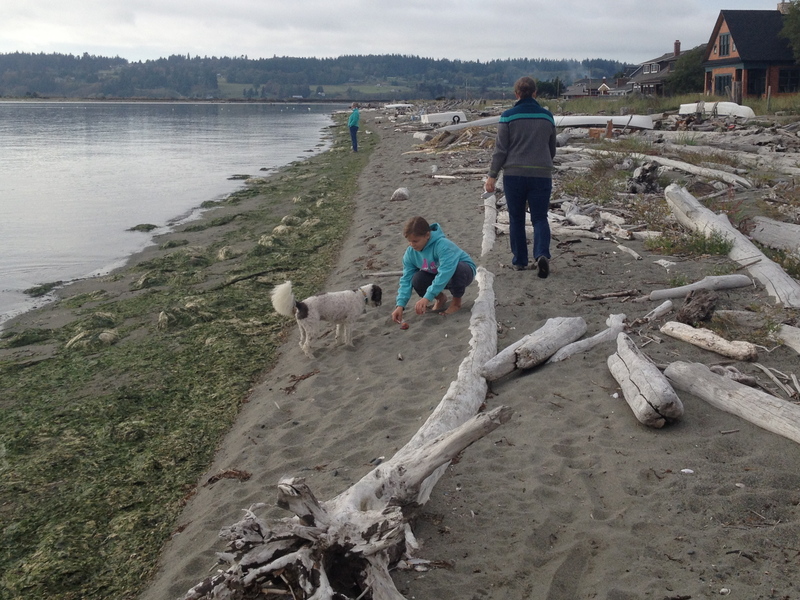 Sunday we headed up to Greenbank Farm, where we visited our friends at the Rob Schouten Gallery, took Teddy for a walk in the fields, and had lunch at the Whidbey Pies Cafe. Robin had huckleberry (of course), Katie had cherry (of course), the girls had salted caramel apple, and I had my usual (a fork). 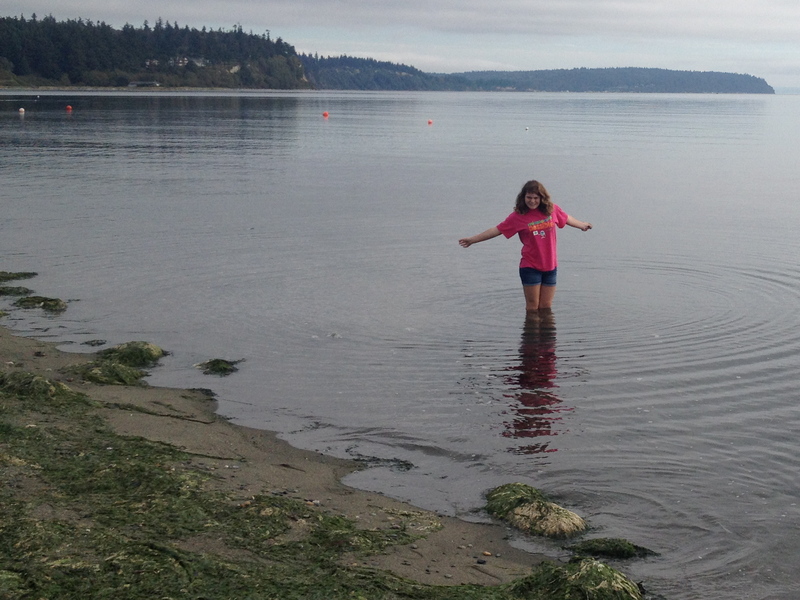 Sophia wades in Useless Bay. On Tuesday, the girls, Katie, and Robin went to a beading class that Robin had arranged with Tammi Sloan, a local artist. Being guys, Teddy and I stayed home. The girls enjoyed themselves, learned some new techniques, and made earrings and Christmas ornaments. Wednesday we went into Langley, the “Village by the Sea.” The women shopped while Teddy and I hung out on the sidewalk and watched the tourists, of whom there were few, this being mid-week in October. The women went to the Star Store, a Langley institution and a must on Semas-family visits to the island. Sophia got a cool sweatshirt and Annika got monkey mittens. But their favorite thing in Langley was watching the glassblowers in the old firehouse, which has been converted into a studio and gallery. The girls were rapt watching two guys turned globs into glasses. After lunch we headed over to Sunlight Beach, where Robin’s grandparents’ house is. The girls and Teddy enjoyed cavorting on the beach, and Sophia went wading, even though the water was pretty cold. The tide was in, so we couldn’t walk out on the tide flats, which are quite extensive. Sunlight Beach is on Useless Bay, so called because it’s so shallow that it’s useless for ships. When the tide is out, you can walk out a mile or more on the sand. You just have to remember to head back before the tide comes in. Thursday Katie, the girls, and I left the island again to go into Seattle. We had planned to go up the top of Columbia Center, Seattle’s tallest building and home of the highest public observatory west of the Mississippi, but the weather had turned and the skyscraper was socked in by clouds, so we headed on to Pike Place Market. We saw the flying fish, strolled the market, and had lunch in a deli. Annika got a necklace with her name on it, which she liked because things with her name on them are hard to come by. The guy made it for her while we wandered around. 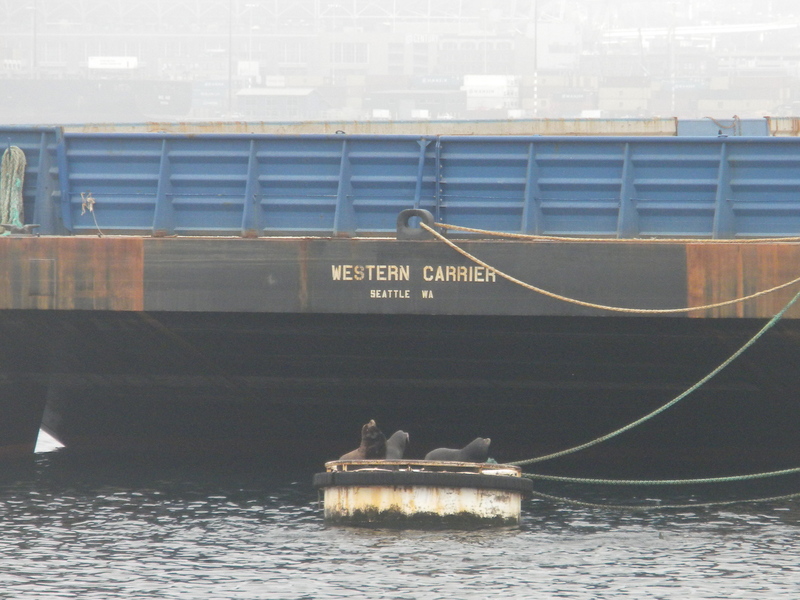 Sea lions atop a piling in Elliott Bay. After lunch we took a one-hour sightseeing cruise around Elliott Bay. The Argosy Cruises boat was only average but the guide was terrific, both knowledgable and funny. He reminded me of the guides on the Circle Line in Manhattan. We saw all the usual waterfront sites, including the Space Needle, seals cavorting on pilings next to barges, and cranes unloading giant container ships. The weather wasn’t the best, but we toughed it out on open deck up top and thoroughly enjoyed ourselves. Recommended for visitors to Seattle. Then we headed back to the island, where we had dinner at Gordon’s on Blueberry Hill, one of the island’s best restaurants. Robin and I had actually won a $50 gift certificate to Gordon’s at the 100th anniversary celebration of Freeland Hall, a historic building just down the road from our rental house. What better way to use it than to entertain Katie and the granddaughters. Friday we planned to go back to Sunlight Beach when the tide was out, but we were having more island weather (cool and cloudy) and everyone was tired, so we had a quiet day at home. The Saturday it was back to the airport for Katie and the girls to head home. We missed them immediately, but we head for North Carolina Saturday, so we’ll see them again in 10 days or so. Annika looks so much like Katie did at her age! 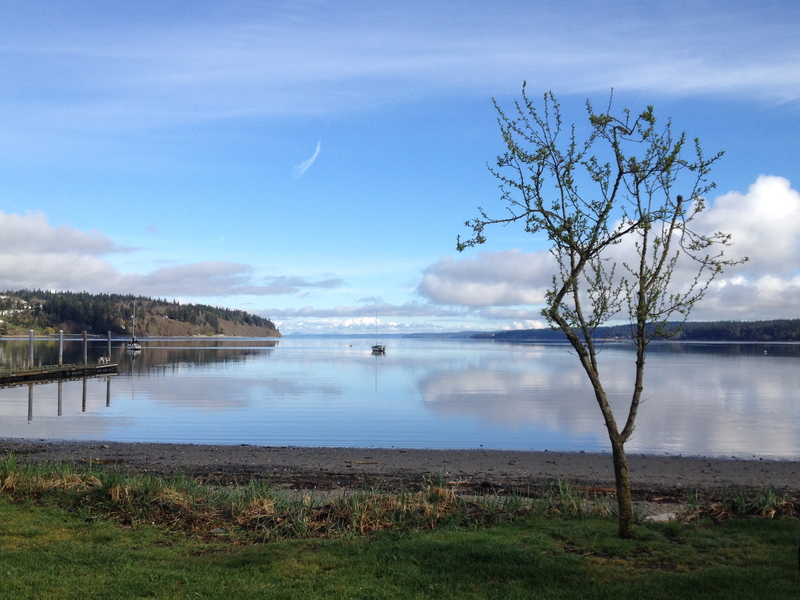 Sounds like you have the “best of Whidbey” down to a science.